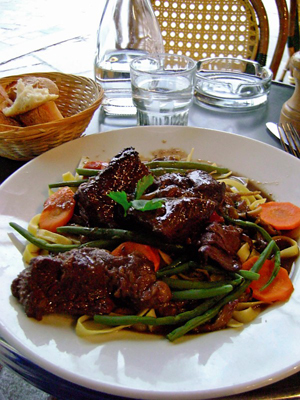 Home » Food » How Did Boeuf Bourguignon Become a Classic? If you’re like me, you like to sample classic French dishes while visiting the City of Light: coq au vin, pot au feu, blanquette de veau, steak tartare … the list goes on and on. 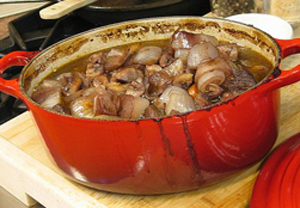 But one of my favorites—and a French classic that also I enjoy making at home—is boeuf bourguignon (beef Burgundy). This rich beef stew consists of beef braised in red wine and beef broth, flavored with thick chunks of bacon, mushrooms, pearl onions, carrots, garlic and bouquet garni. And it is flat-out delicious! But how did this dish become a French classic? Like many traditional French recipes, its roots lie in “peasant foods”–dishes that were staples over the centuries for the poor and the working class. Out of financial necessity, these “peasants” developed unique cooking methods to turn plentiful and cheap local meats and produce into inexpensive meals to feed their families. Boeuf bourguignon originated hundreds of years ago in the Burgundy region in eastern France (called Bourgogne in French)—which explains why the traditional wine used to braise the beef is a Burgundy red, usually a pinot noir or chardonnay, but many cooks opt for a Chianti. Burgundy’s peasants had easy access to these cheap, locally produced red wines, and used them to slow cook inexpensive but less tender cuts of beef, often the scraps that were not desired by more wealthy families. 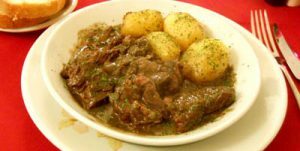 All of the other ingredients in boeuf bourguignon, even the thick pieces of bacon (called lardons in French), were plentiful—and cheap—throughout the Burgundy region. 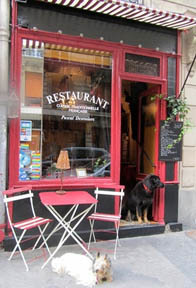 The resulting stew is so hearty, tender and tasty that over time it became well known throughout France, and has been a bistro standard in Paris for more than a century. 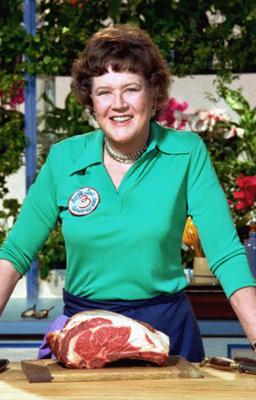 In her cookbook, Child calls boeuf bourguignon “certainly one of the most delicious beef dishes concocted by man.” You’ll get no argument here! This entry was posted in Food, French cuisine, Restaurants and tagged 48 Condorcet, Auguste Escoffier, boeuf bourguignon, Julia Child, peasant food by Bob Adams. Bookmark the permalink.